A few years back I went to visit a school called Celebrate the Children that was doing some really innovative work with children on the spectrum. Among other things, teachers at Celebrate the Children made use of visual posters in their classrooms in a way that I had never seen before (still don’t see elsewhere). 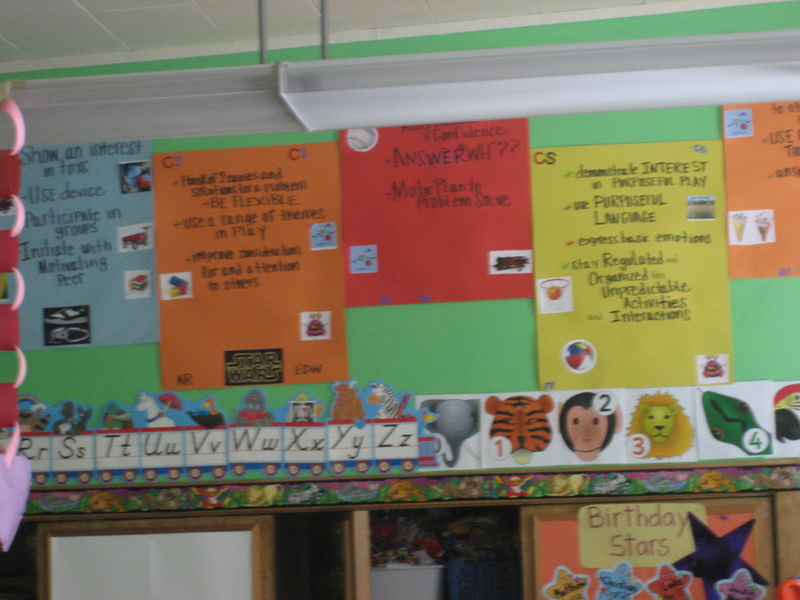 Not only were these visual posters there for the children (who often process visually with much greater clarity than they do verbally) but also for the teachers and aides. In bright neon colors bordering the room, the teacher I observed had posters that read things like “working on reciprocal engagement”…”transitioning out of gym”…”accessing heavy work when upset”, etc. Next to each of these short sentences were students initials. When I asked what these posters were used for, the teacher shared that they helped to remind her (not the kid but the teacher!) of the specific goals each of her students were working on. BRILLIANT! Why don’t we do this? I find myself often needing reminders about specific deficit areas that children need to strengthen. By posting these reminders in a visible area (kitchen cabinets, my office walls, etc), we keep ourselves mindful of our child’s specific goals while not getting overwhelmed by all there is to remember (one or two goals at a time, then switch the goal for the week/month). In this study, we are reminded of the shocking disparity between teens with ASD and typically developing teens when it comes to social participation and friendship. With deficits in all areas of social interaction, it comes as no surprise that individuals with ASD struggle to engage in friendships. Instead of being discouraged, this is all the more reason why these children and teens need to be meeting with friends on the weekends, connecting with friends for after school activities, and watching movies and playing video games together as regularly as possible. The activity really doesn’t matter, it’s the exposure to peers and the building of pro-social skills (disagreeing and making compromise, giving other’s a choice, taking perspective, reading social/emotional non-verbal gestures, etc.) that matters. As parents, teachers, and counselors, we can help initiate these pairings (view my “Make a Match program” posts). If you don’t plant and cultivate the seed (exchange info with another parent to see a movie, come over to play video games, eat McDonald’s (? ), whatever) it may never take root and grow. No amount of counseling and/or social skills groups can compare with real peer-to-peer experience (that’s coming from a person who believes in and makes a living by providing the above mentioned services). Parents/Teachers: Read this article after reading the “Sensory Tool Kit…” post. It will feel like the next step in helping you be more intentional and planful around your child’s particular sensory needs. The below link by well known ASD professional Carol Kranowitz, provides targeted exercises (sensory experiences) that will help your child build tolerance and competency in the sensory areas that they struggle. In addition, you will be meeting their sensory needs in a proactive way by incorporating exercises and experiences into their daily routine. PLease leave a comment with any questions about the article you may have. Check out PAGE 2 and 3.